I am almost at the end of my ‘Melanoma Month’ project – my first foray into the weird world of Twitter. Quite late in the evening on 1st May, when us Mummies should have been sensibly heading off to bed, my friend and I were still up chatting about Ben’s blog and ideas for keeping it alive. She came up with the idea of using the official designation of May as ‘Melanoma Month’ as a hook for my own Twitter campaign – tweeting one of Ben’s posts for each day of the month. I loved the concept, and having no time at all to procrastinate (it being 10.30 by this point), I quickly signed myself up to Twitter, sent out my first tweet and announced my grand plan to the Facebook world. Now it’s almost over I feel glad that I did it, although it hasn’t always worked out exactly as I’d expected and I’ve been through a gamut of feelings about it since that night. I started off very excited – I had no followers so I was immediately on a mission to find the right sort of people and organisations to follow so that I could hopefully coax them into following me. After a few days my excitement was taken over by a gloomier mood – I didn’t like the fact that I was now spending all my free time reading cancer blogs and looking at cancer charity websites – it was bringing me down. So I tried to step back from it a little. While my ‘campaigning’ efforts did reap a few rewards, with some key organisations following me (MacMillan, Pilgrims Hospices, British Association of Dermatologists, AIM at Melanoma), I was getting very few retweets and it wasn’t having any significant impact of blog traffic. Meanwhile the tweets were also coming up on Facebook. After the first day or two’s excitement I started to worry about the fact that all my friends on FB were seeing these tweets – maybe they’d had enough of this already and it was making me seem pitiful and obsessed. I decided to put that worry to one side, especially as I could see that the blog was getting regular hits via Facebook. From the likes and comments I could see that some people who had read it before were grateful for the chance to read it again, but a little each day rather than being faced with the whole thing all at once. Plus there were some new readers – people I’d befriended since Ben had died. So although as a ‘Twitter campaign’ it hasn’t really worked (I don’t feel it’s helped to get it ‘out there’ in any major way), it has meant that the blog has had visitors every day (around 20-30 on average), several them reading it for the first time. And I’ve learnt a bit about Twitter and can keep using it now and then to publicise blog-related stuff. So not a waste. The most unanticipated impact of the Twitter project has been on me personally. Every day at breakfast time I load up the computer, read the next post and then try to come up with a punchy little tweet to sum it up. Day by day I have been rereading and reliving Ben’s last ten months, and as the end of the month has approached I have felt a sense of sadness and foreboding, knowing what is to come. It feels as though by sharing his story again in this way I am bringing about his death all over again. Often I have woken up early and read through and thought about the post while waiting for Saskia to wake up, or been thinking about it through the night. Sometimes a post has preyed upon my thoughts throughout the day. I think I will feel relieved when the month is over – it has been emotional and sometimes a darker experience than I’d predicted – and I’ll be glad to be on the other side. Categories: Uncategorized | Tags: social networking, twitter | Permalink. Going to see my counsellor seems a bit like stepping into the confessional box. It got me thinking on my drive home from seeing her the other day, what a cathartic, freeing activity confessing is. I’m no Catholic, and I’m pretty sceptical about it in its ritualised form, but I can see now the appeal and can understand what a powerful experience it can be potentially. Whether my ‘sins’ are actually that is another question. I don’t believe that being happy and feeling fullfilled and free can be sins, but again and again my ‘grieving widow’ mantle makes me feel guilty nonetheless. So I confess – to something that doesn’t need confessing – but it makes me feel better anyway. This time I confessed that when I think of Ben all I can remember with any vividness are the difficult times last year, and how he looked and was in his last months. With huge globular tears I blurted this out – I feel so ashamed of it. Poor Ben – he deserves to be remembered at his best, not as he was during those dark times. When I think of the word ‘widow’ I think …. That’s what everybody thinks of, right? Yet I struggle on a daily basis with the fact that I am absolutely none of these things. I suppose I am grieving, but this doesn’t seem to entail the misery that I would expect. Though I feel relaxed about the fact that I have no compunction to wear black and dress like a dowdy old Victorian , I do feel troubled that I am not feeling miserable or depressed or lonely or lost or a ”shadow of my former self’ etc etc. That’s what people expect, it’s what I expect – or did expect until I found I wasn’t conforming with my literary/media-fuelled stereotype a la the brainstorm above. The truth is I’ve been very happy over the last few months since Ben died (there you see – I flinch at the cold, unfeelingness that that sentence seems to betray)…I love my relationship with Saskia; we have an amazing, frequently hilarious time together; I’ve got lots of wonderful friends with whom I can hang out and talk to about things so I never have to feel alone; I’ve got a great home and enough money; I’ve got time and freedom for myself to do the things I enjoy. Those are all reasons to be happy – and my enjoyment of them is not tarnished by depression or sadness or emptiness or any of the other feelings that I would expect at this time. I would have expected anything but happiness! So this makes me a cold, unloving cow right? Surely if I’d really loved Ben I’d be a mess now, right? Or missing him more? In talking to my counsellor today I came to realise that there is a common assumption that the degree of pain and ‘messed-up-ness’ a person feels over a lost loved one is directly proportional to how much they loved that person. Is this true? Or is it just an easy assumption, and in fact the degree of pain has absolutely nothing to do with the degree of love and more to do with how the person deals with that loss? I prefer to believe the latter – it sounds more likely, plus it gives me permission to stop beating myself up about being happy (not that it’ll stop that little guilt gremlin bugging me altogether – maybe one day it’ll leave me in peace). Wow – quite a mix! Which I guess goes to show what rubbish stereotypes are. 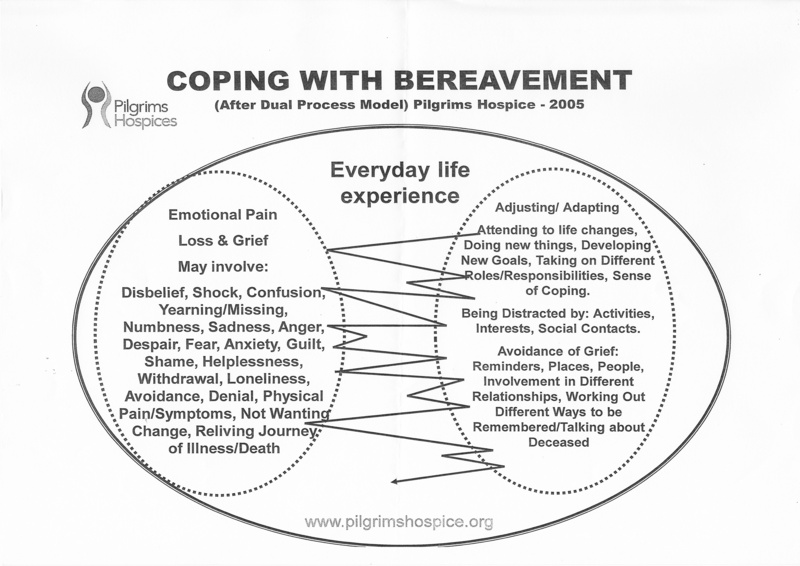 My counsellor gave me today a diagram based on something called the ‘Dual Process Model’ – it divides coping with bereavement into two processes ‘Emotional Pain/Loss & Grief’ and ‘Adjusting/Adapting’ and shows an arrow zig-zagging back and forth between the two – so I guess I fit right in with this model with this collection of feelings. I just seem to be doing quite well at moving towards the Adjusting/Adapting and am not too stuck on the Emotional Pain side. And that’s OK! Categories: Uncategorized | Tags: grieving | Permalink.